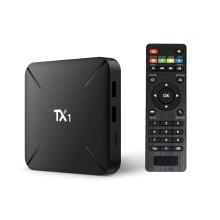 TX1 is a smart streaming multimedia player built-in Android 7.1 system. You can enjoy all your favorite movies online or programs on TV, and you also can play thousands of Android games on a large screen smoothly. TX1 is powered by Quad-core Cortex A7, giving you high-speed feedback and smooth response. Mali-400 GPU makes it good at high-definition pictures and videos. TX1 supports H.265 decode which can save 50% bandwidth resources and enables you to watch the 4K movie smoothly. 4K is 4 times of Full HD, so every detail of the screen is lucidity. TX1 can support HD and 4K ultra-high-definition video content, and help to change your living room into a home theater. 1GB DDR3, 8GB Flash and external TF Card storage up to 32GB gives you more space to download your favorite movies and to browse websites, play games, watch movies more smoothly. Built-in 2.4G Wi-Fi offers a stable network for you to enjoy high-quality video experience. TX1 is a smart streaming multimedia player built-in Android 7.1 system. You can enjoy all your favorite movies online or programs on TV, and you also can play thousands of Android games on a large screen smoothly. TX1 is powered by Quad-core Cortex A7, giving you high-speed feedback and smooth response. Mali-400 GPU makes it good at high-definition pictures and videos. TX1 supports H.265 decode which can save 50% bandwidth resources and enables you to watch the 4K movie smoothly. 4K is 4 times of Full HD, so every detail of the screen is lucidity. TX1 can support HD and 4K ultra-high-definition video content, and help to change your living room into a home theater. 1GB DDR3, 8GB Flash and external TF Card storage up to 32GB gives you more space to download your favorite movies and to browse websites, play games, watch movies more smoothly. Built-in 2.4G Wi-Fi offers a stable network for you to enjoy high-quality video experience. Note: The remote controller of the product belongs to the attached and functional accessory. If a part of the product functions can&apos;t be controlled by the controller, please purchase external mouse or air mouse to operate. Video Formats: MKV, WMV/VC-1 SP/MP/AP, MPG, MPEG, DAT, AVI, MOV, ISO, MP4, RM, H.264, H.265, RealVideo 8/9/10, VP8/9, up to 2160P. Support language: Chinese, English, Germany, Japanese, Korea, etc. 24 languages.